LMS Class 5 4‑6‑0 No. 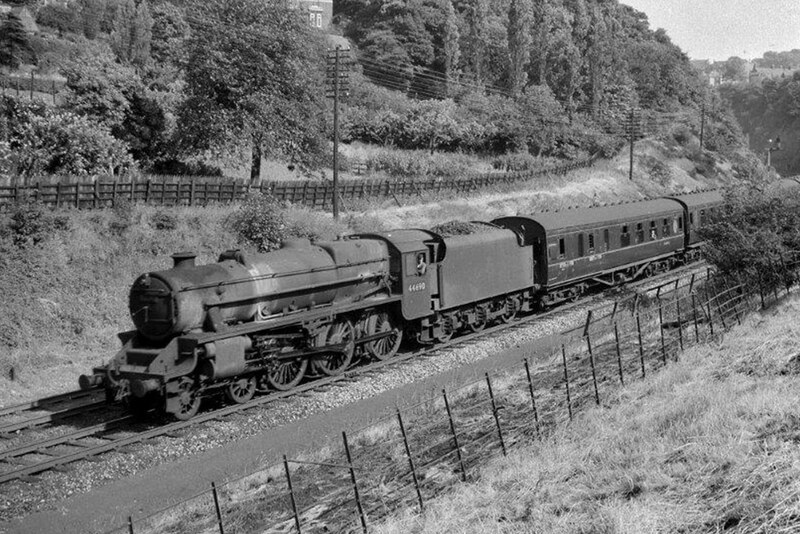 44690, possibly from 16C Derby, is captured on film in the picturesque surroundings of Dore & Totley in Derbyshire on an unknown date in the 1960’s at the head of a local passenger. Transferred to 10F Rose Grove in March 1966 No. 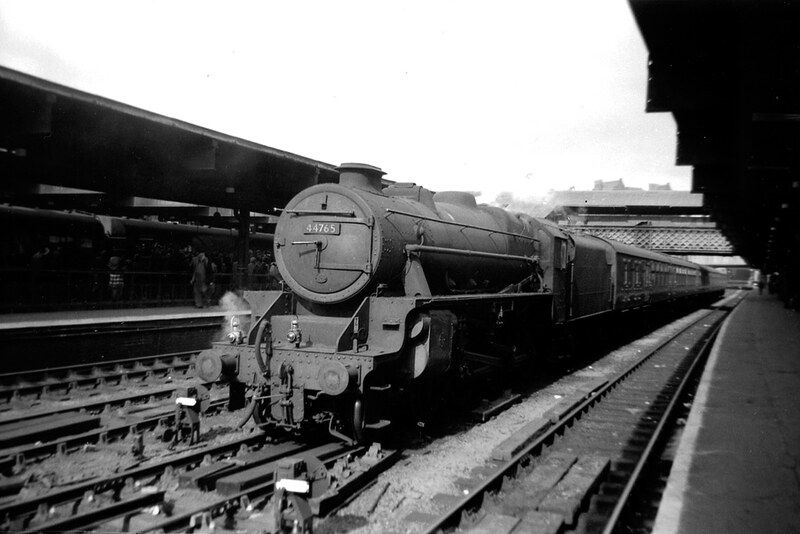 44690 was rendered surplus to requirements at the end of steam in August 1968. LMS Class 5 4‑6‑0 No. 44765, from 5A Crewe (North) and equipped with a double chimney, basks in warm summer sunshine on a centre road in the former LNW side of Birmingham (New Street) with the empty coaching stock of the 6.49am express from Crewe on 6th July 1962. 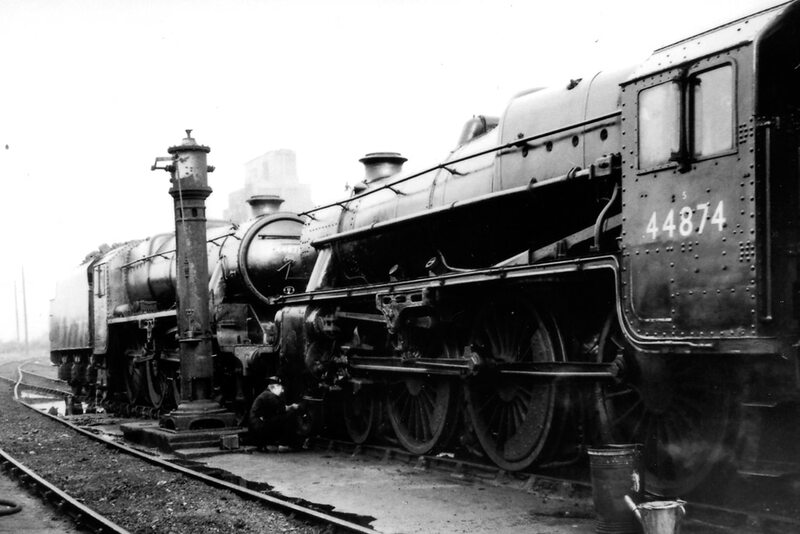 LMS Class 5 4‑6‑0’s Nos. 44871 and 44874, both of 10A Carnforth, are in sparkling external condition at 10D Lostock Hall on 30th July 1968. During the ‘last rites’ of steam quite a number of locomotives, mainly ‘Black Fives,’ were ‘buffed‑up’ at Lostock Hall by members of the cleaning staff and enthusiasts alike prior to them working their last passenger duties. No. 44871, thankfully, is still with us today. Note: There are no known additional amendments or queries appertaining to the disposals of the LMS Class 5 4‑6‑0’s Nos. 44658 to 44899, but any information to the contrary will be welcomed as would any confirmations or otherwise of the verifications required. Author’s Note: Discrepancies between the monthly withdrawal dates as published in the 1982 edition of WHTS Volume Twenty Four and the updated versions online are negligible. Note: Draper’s, Hull: Up until the week beginning 20.11.67 locomotives were cut up in Sculcoates yard. After this date cutting up was carried out in new premises in Neptune Street. All cut up dates recorded are the week commencing.